BY Ali Selman Benoist, MD : As a Doctor of Medicine, and a descendant of a French Catholic family, the very choice of my profession has given me a solid scientific culture which had prepared me very little for a mystic life. Not that I did not believe in God, but that the dogmas and rites of Christianity in general and of Catholicism in particular never permitted me to feel His presence. Thus my unitary sentiment for God forbade my accepting the dogma of the Trinity, and consequently of the Divinity of Jesus Christ. So, it was first of all for metaphysical reasons that I adhered to Islam. Other reasons, too, prompted me to do that. For instance, my refusal to accept Catholic priests, who, more or less, claim to possess on behalf of God the power of forgiving the sins of men. Further, I could never admit the Catholic rite of Communion, by means of the host (or holy bread), representing the body of Jesus Christ, a rite which seems to me to belong to [totemic] practices of primitive peoples, where the body of the ancestral totem, the taboo of the living ones, had to be consumed after his death, in order better to assimilate his personality. Another point which moved me away from Christianity was the absolute silence which it maintains regarding bodily cleanliness, particularly before prayers, which has always seemed to me to be an outrage against God. For if He has given us a soul, He has also given us a body, which we have no right to neglect. 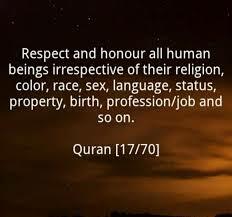 The same silence could be observed, and this time mixed with hostility with regard to the physiological life of the human being, whereas on this point Islam seemed to me to be the only religion in accord with human nature. The essential and definite element of my conversion to Islam was the Quran. I began to study it, before my conversion, with the critical spirit of a Western intellectual, and I owe much to the magnificent work of Mr. Malek Bennabi, entitled Le Phenomene Coranique, which convinced me of its being divinely revealed. There are certain verses of this book, the Quran, revealed more than thirteen centuries ago, which teach exactly the same notions as the most modern scientific researchers do. This definitely convinced me, and converted me to the second part of the Kalima, ‘Muhammad Rasul ‘Allah’ (Muhammad is the Messenger of Allah). This was my reason for presenting myself on 20th February 1953 at the mosque in Paris, where I declared my faith in Islam and was registered there as a Muslim by the Mufti of the Paris Mosque, and was given the Islamic name of ‘Ali Selman’.